Every Art class, K-12, in my district had at least one lesson focused on East Asian cultures to prepare for Cultural Heritage Week this year. We had learned about Darumas- Japanese dolls- but I hadn't thought about how I might use it until I saw this post from Phyl at There's a Dragon in my Art Room! 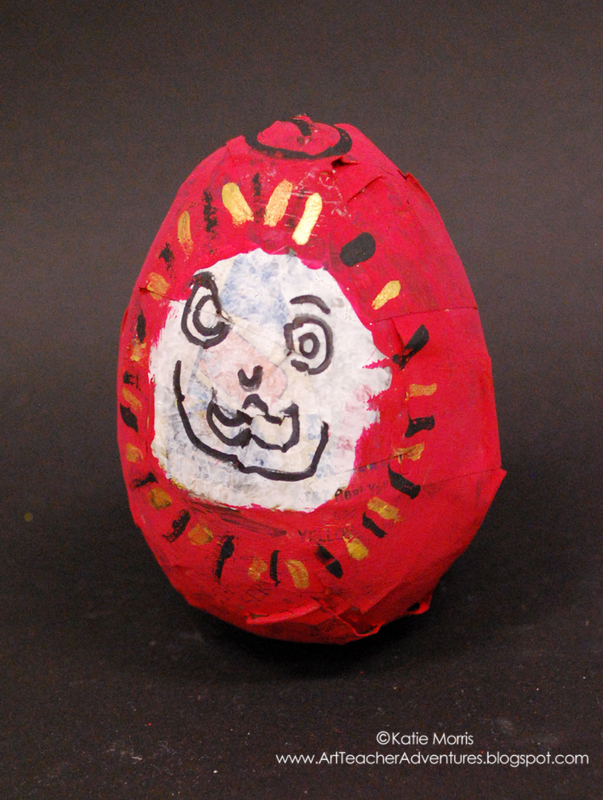 Her 6th grade students used plastic Easter eggs as the base for a papier mache Daruma doll, then painted. I figured I'd give it a shot with 3rd grade- they'd never used papier mache before and we don't do a ton of 3D projects due to a LARGE enrollment and limited storage. 6th graders would be able to handle this a lot better! I bought the largest Easter eggs I could find in quantity after Easter last year and even then, I think the small size was a little tricky for them. I also goofed and forgot to take newspaper to school so we had to use phonebook pages, which don't go on quite as smoothly for some reason. Despite this being a challenging project, it was good for the students to get more 3D experience in a new medium while learning a little about another culture. You may have noticed that the Darumas only have a pupil in one eye. The owner draws or paints in one pupil as they set a goal or make a wish and don't add the other pupil until they have achieved their goal or their wish came true! Sorry you had a hard time with this. 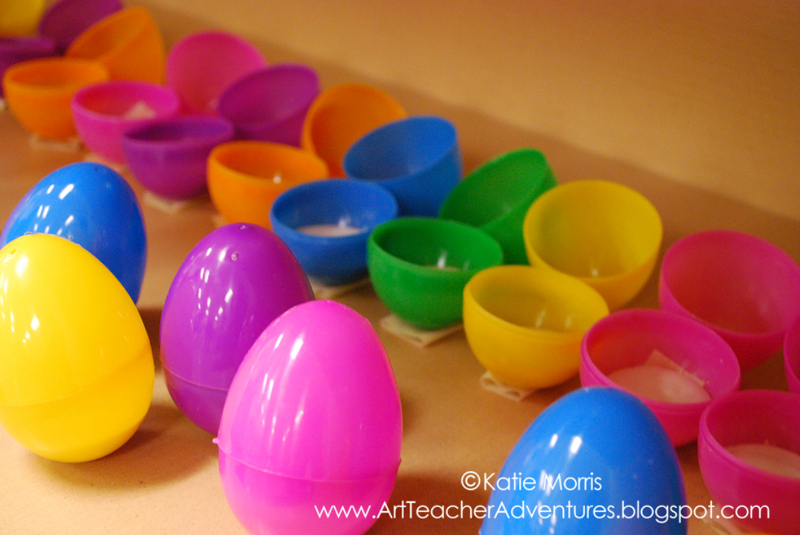 I used plasticine cay inside the eggs to weight and balance them. I recently saw a blog post where papier-mâché Angry Birds were made, over small balloons. They totally looked like they could have been Darumas! I don't squally papier-mâché over balloons, but in this case it could work good I think. It's ok! 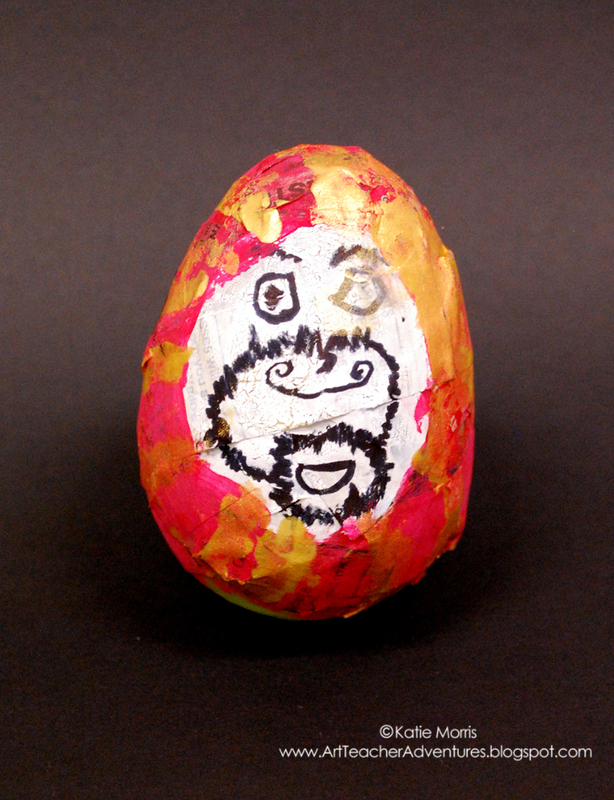 It was my fault- no experience in papier mache with students and I didn't think about the small size (all we have room for) being too small for most of their motor skills. :) They still had fun! 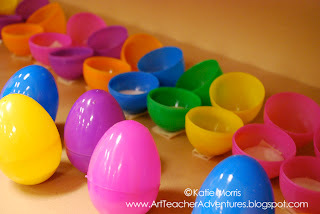 By the way, Katie, we papier-mache'd our little eggs with paper toweling, but DON'T DIP IT IN THE GOO!! 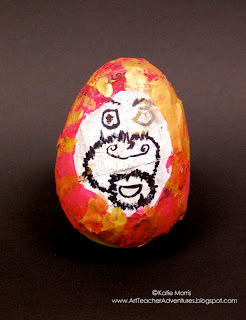 I have a much more practical and effective method for whenever you use papier-mache. Just dip your fingers in the goo, rub it together on the palms of your hands, and then touch a piece of toweling or newspaper (it will stick to your finger) and rub it between your palms to saturate with goo. Then place it on your armature, whatever it is, and massage it smooth. This way you won't end up with slimy, drippy messes when you do papier-mache. Trust me; I have LOADS of experience.